In honor of St. Patrick’s Day, and due to a deep love of Ireland, Lake Effect Living is spotlighting a few of the Emerald Isle’s gorgeous lighthouses. Did you know there are over 100 scattered along coastal Ireland? Like the lighthouses around the Great Lakes region, many were built in the 1800s. Ireland’s western coast is quite rugged and dashed by the Atlantic’s full force. 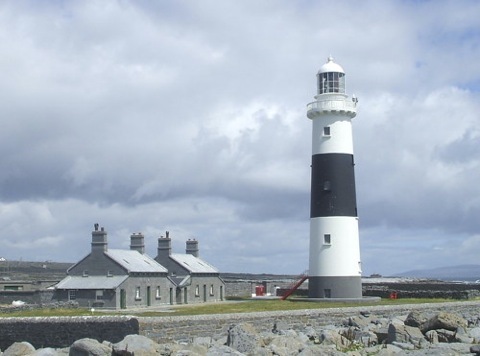 The lighthouses are almost all in service and maintained by the Commissioners of Irish Lights. Several are accessible by ferry or road, depending on the area. 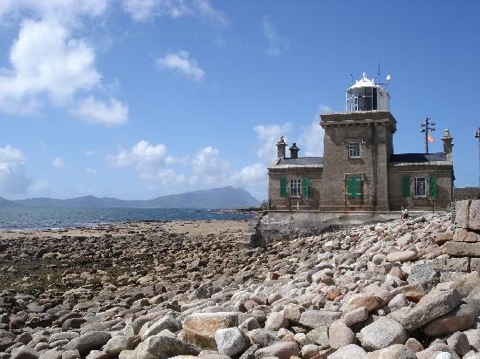 Two of Ireland’s most remote lighthouses are Blacksod and Blackrock. Blacksod, located on the Mullet Peninsula’s south end in County Mayo, was built from the local granite that it stands on. 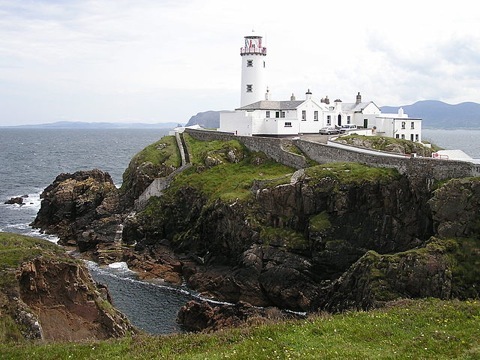 It was established June 30, 1866, and is one of only two square-shaped lighthouses in Ireland, with a conical lantern on top painted white. The keeper’s house has never been painted. Repairs had to be made after an Atlantic wave damaged it. The keeper at Blacksod is also responsible for Blackrock Lighthouse, originally built in 1864 and converted to solar power in 1999. 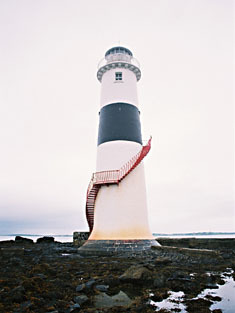 The 50-foot tall round white-painted tower on an island 12 miles west is accessible only by helicopter. On August 20, 1940 several lantern panes and the roof were damaged by gunfire from a German bomber attacking the SS Macville which was sailing close to the rock. No keepers were hurt in the attack. Another beautiful lighthouse is located on Inisheer island, the easternmost and smallest of the Aran islands facing the headland of County Clare in Galway Bay. This lovely tower, adjacent to two keeper dwellings, doesn’t have a name – just ‘the lighthouse of Inisheer.’ Gaelic is spoken by its 300 residents, and many school children from the mainland come here to learn the language in a natural environment. The island also has several church ruins and the medieval O’Brien castle on the hilltop, built on an ancient stone fort. 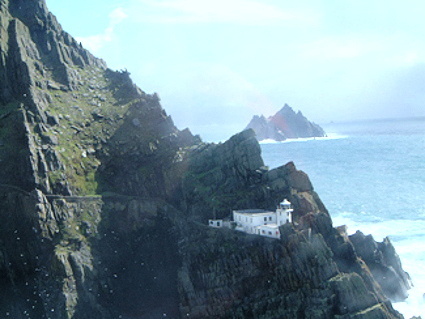 Skelligs Lighthouse began operation in December of 1826 and became fully automated in the spring of 1987. Skellig Michael (Gaelic for Michael’s rock) is eight or nine miles from the mainland’s southwest coast of County Kerry and northeast of Puffin Island. Irish Christian monks founded a monastery on the rock in the 7th century. In the early 1800s, construction of the lighthouse buildings and roads took five years after a little haggling over property rights. The resident at that time, Mr. J. Butler, was very willing to accept £30 per annum for the 986 years remaining on his lease. It seems that Butler raised 100 sheep in summer and 50 in winter after paying 16 to 18 stone of puffin feathers to a mainland landlord. After authorities inquired about whether Mr. Butler could sublease, the property was purchased instead and £780 deposited into the gentleman’s estate. 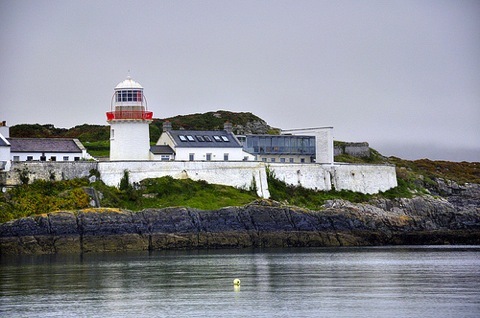 Last but not least, at the southwest tip of Ireland, County Cork, is Crookhaven Lighthouse. It stands on Rock Island at the entrance to the finger-like harbor. Built in 1843, the lighthouse has several outbuildings that also served as dwellings for the keepers of Fastnet Lighthouse and the Mizen fog station. These outbuildings now serve as a ‘holiday house’ for tourists. The village also has an interesting history, since Guglielmo Marconi stayed in the area to research his wireless communication – the radio and ship-to-shore transmissions – from 1901to 1914 before he sold the technology rights. If you’re considering a trip to Ireland, make sure to include checking out the views of the Atlantic Ocean from one of these stunning lighthouses!